View More In Teachers Calendars & Planners. Rich, vibrant color with Blue accents makes this 12-month, academic year, color collection, mini desk pad calendar a statement piece! six different, solid colors featured throughout the year. The monthly tear-off pages boast large, monthly grid space for appointments, to-dos and reminders and has a glance view at the previous and next months. This calendar spans July 2018 - June 2019. High quality, thick paper allows for smooth writing and easy erasing as plans often change. 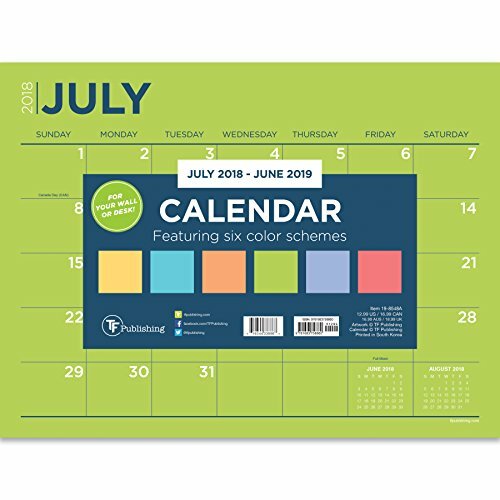 This 12" x 9" desk calendar can either lay flat on a desk or hang on the wall by the drilled hole. Comes packaged in a Poly bag. If you have any questions about this product by TF Publishing, contact us by completing and submitting the form below. If you are looking for a specif part number, please include it with your message.